As a political symbol and an athletic powerhouse, Serena Williams is “the greatest” in her sport. There are numerous articles—terrific articles—defending Serena Williams against the racism and sexism that have long stalked her career. This will not be one of those articles. As long as gutter invective is hurled at Serena, there will always be a need to defend her—and by extension stand up for everyone who feels the primary sting of these attacks. 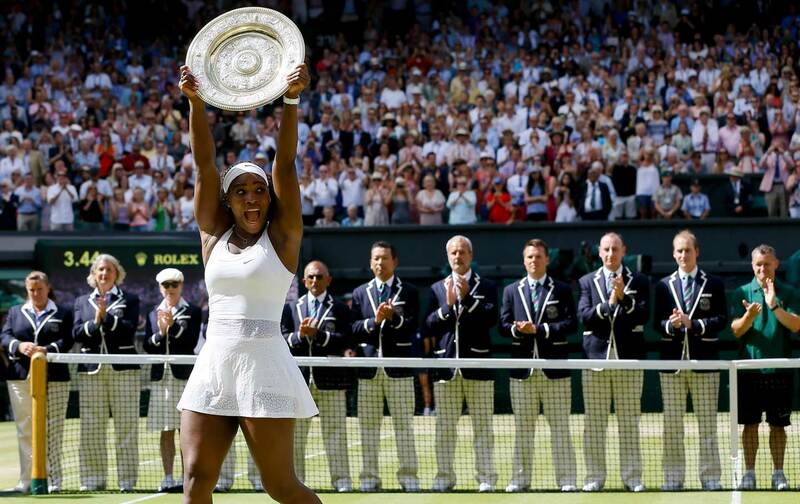 (J.K. Rowling is even standing up for Serena, adding a new dimension to her #blackgirlmagic.) But, just as I wrote last week about not merely “defending” women’s sports but actually going on “offense,” we need to be similarly aggressive in stating factually just who Serena is becoming before our very eyes. If our eyes remain narrowed in a defensive stance, we could be missing a transcendent chapter in sports and social history beginning to coalesce. Serena Williams just won her 21st Grand Slam. That’s the same number every other active women’s player has collected combined. In her last 28 matches she is 28-0, and at the US Open this August, Ms. Williams will be favored to win the sport’s first calendar Grand Slam since Steffi Graf did it 27 years ago. 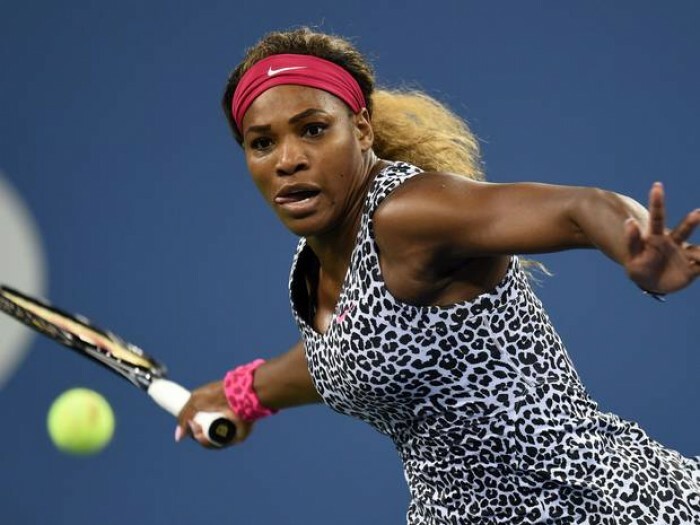 At 33, Williams actually seems to be gaining strength, and as John McEnroe said to ESPNW’s Jane McManus, among women, “she could arguably be the greatest athlete of the last 100 years.” I think this even understates her case. She is our Jordan. She is our Jim Brown. She is our Babe Ruth, calling his shots. She is no longer content to dodge bullets, but understands how to stop them. Serena is that rare athlete who has not only mastered her sport. She’s harnessed it. But Serena Williams is more than just our 21st-century Michael Jordan. If we take a break from defending her, which her detractors do not make easy, it becomes increasingly clear that she is also perhaps our Muhammad Ali. That’s sacrilege in some circles, and understandably so. Ali risked years in federal prison to stand up to an unjust war, becoming the most famous draft resister in history. His very presence at different points inspired the first Pan-Africanist stirrings of Malcolm X, the anti-war evocations of Dr. Martin Luther King Jr., and the very mental survival of a prisoner half-way around the world named Nelson Mandela. There is and never will be anyone like Ali, without question. But this is also not the 1960s, and there will also never be anyone like Serena. Serena Williams is our Ali, and before defending that statement, I want to break down what, in my view, makes Ali “Ali.” To be in Muhammad Ali’s tradition of athletes, there are three basic boxes one would need to check: The first is that the sportsperson in question would need to be amongst “the greatest” in their field. As mentioned above, Serena more than checks that box. Secondly, one would have to be polarizing in a way that speaks to issues beyond the field: thrilling some people politically and enraging others with every triumph. Similarly, a loss would feel like more than “just a game” to their fans: more like a punch to the gut. Lastly, to even be in this conversation, one would have to not just “represent” or symbolize a political yearning but actually stand for something, and risk their commercial appeal by taking such stands. Serena doesn’t only check these boxes. She has, I would argue, confronted—and overcome—more obstacles than even the great Muhammad ever had to face. Her political powers of representation, every time she emerges victorious, is off the meter. Symbolically, the very audacity of Serena Williams—a black woman from Compton who has owned a country-club sport with style, flair, and the occasional leopard suit, is without comparison. She is “peak Tiger Woods” in skill, but cut with Ali’s transgressive style: the equivalent of the Champ telling the craggy, macho world of boxing that he was “so very pretty.” But not even Ali had to achieve in an atmosphere as inhospitable as Serena’s athletic setting. This is about the very particular intersectional oppression she has faced as a black woman. This iconic body she proudly inhabits—her shape, her curves, her musculature—has been the subject of scorn, regardless of the results. Even at his most denigrated, Ali’s loudest detractors conceded that his physical body was a work of athletic sculpture. As a man—a black man—he was objectified with a mix of admiration, longing, and envy, in the ways black male athletes have always been seen since the days of plantation sports. It was his mind and mouth that truly made him threatening. People wanted Ali to “shut up and box” for years before finally stripping him of his title. But as that phrase implies, they still wanted him to box. Not Serena. Instead, she has had to face a tennis world that has made it clear in tones polite and vulgar that it would be so nice if she wasn’t there. But she has shut them all up with the same wicked power that defines her game. She, like Martina Navratilova before her, has forced sportswriters and fans to confront what a female athlete’s body can look like, and they have often responded as terribly as we would both expect and fear. While overwhelmingly male sports media and many tennis fans mocked and continue to belittle her appearance, Williams brushes them off—at least publicly—like so much shoulder dust. The greater her stature, the more pathetic they look. The higher her profile, the lower they seem. In Ali’s day, William F. Buckley saw it as his “white man’s burden” to tear him down. Serena has Buckley’s media spawn attempting the same and they look just as small, just as pathetic. She has been a voice for women’s pay equity in the sport, backing her sister Venus’s powerful push for economic gender justice in a sport that at one time paid women with bouquets of flowers. Most compellingly, as the Black Lives Matter movement has attempted to focus the nation on both police violence and the injustices that surround our system of mass incarceration, Serena has chosen to partner with the Equal Justice Initiative, an organization that fights for prisoners’ rights amid the racism that pervades our criminal-justice system. In a move as audacious as it was affecting, she even tied her return to Indian Wells, a tournament she had boycotted after being showered with racist catcalls in 2001, to the raising of money for the organization. Using boxing as a platform for these kinds of politics amidst the 1960s was certainly legendary. But doing it in 2015 in the world of tennis? It’s simply above and beyond, like clearing a hurdle while wearing cement shoes. If anything, the greatest difference between Serena and Ali is the absence of that mass social movement to elevate her presence and push the non-believers to see what we have in front of us. Muhammad Ali went from despised to beloved because a mass black-freedom struggle and anti-war movement took him as their own. He became more than an athlete: He became a social question. Similarly, a movement fighting for #BlackLivesMatter and gender justice, a movement of struggle that includes the young women of Ferguson, Bree Newsome, and everyone fighting fiercely to reshape this country, has the potential to deliver Serena Williams to even greater heights. She is also becoming a social question, because she represents in so many ways the questions that people are facing in their daily lives. In other words, she poses this very sharp interrogation to the viewer: When you see her serve, her volley, and her physical self; when you hear her words, her concerns, her causes, which side are you on? This remarkable athletic force of nature, or those trying—and failing—to tear her down?